English composer born in the parish of St. Botolph, Colchester in North Essex on December 12th, 1698. He was the son of John Gibbs, a wait or a member of one of the official bands of musicians maintained by Colchester Town. The youth possibly studied music in London with Thomas Roseingrave but returned to live in Colchester and become the town's leading professional musician. In 1744 he was appointed organist in the village of Dedham, Essex and two years later saw the publication of his best known work -- his Eight Solos for Violin and Continuo. In terms of English musical history they are of great importance and have been favorably compared to those of Handel. H. Diack Johnstone described them as the finest English violin sonatas of the 18th Century. They are lyrical and distinctive with the final sonata (No. 8) demonstrating Gibb's experimentation in double stopping. Judging by the list of subscribers to the work, which includes such eminent composers as William Boyce and Maurice Greene, Gibbs was already clearly recognized as a composer of considerable merit. The list also contains two organists named Gibbs indicating that the composer probably came from a musical family - he may well have descended from Richard Gibbs the 17th Century organist of Norwich Cathedral. In 1748 he was appointed organist at the church of St. Mary le Tower in Ipswich, Suffolk; a post he held for the rest of his long life. He presumably moved from Colchester to take on the new position as he was offered £22 per annum "if he comes to reside in the town.....otherwise we do agree to chuse a new Organist." Judging by the frequent notices in the Ipswich Journal, Gibbs played a large part in the musical life of the area and gave many charitable concerts in the area. He was a prominent organist and recitalist, playing on many occasions to mark the installation of new church organs. One instance was at Hadleigh on November 17th, 1773 when choral music by Purcell, Croft and Handel was played with the new organ "opened by Mr. Joseph Gibbs." In 1763 he was involved wth the theatre -- a notice regarding Bickerstaffe's comic opera Love in a Villageat the Ipswich Playhouse stated, "a proper Band of Musick will be provided and the songs accompanied with the harpsichord by Mr. Joseph Gibbs, Organist". He was a member of the Ipswich Musical Society which met at a Mr. Sparrowe's home, now known as the Ancient House, in the Buttermarket, Ipswich. The painter Thomas Gainsborough (1727-1788) who moved to Ipswich in 1752, was an enthusiastic amateur musician and also a keen member of the society. 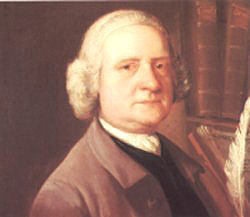 He painted a group of its members and also Gibbs' portrait. The picture shows two books on the shelves behind Gibbs with the names Corelli and Geminiani printed on their spines, indicating these composers' probable influence on Gibbs' musical life. The eight violin sonatas are dedicated to the London banker Sir Joseph Hankey. This indicates that Gibbs almost certainly knew the composer Michael Festing who was good friends with Hankey. Besides his sonatas, Gibbs' only other works to survive are a set of string quartets (also subscribed to by Boyce and Greene) and some organ pieces. The string quartets, for 'Two Violins, a Tenor and Violin-cello or Harpsichord' were published in 1778 and were amongst the first string quartets to be published written by an Englishman. Gibbs married, but when is unknown, and had a son and two daughters one of whom trained as an organist. The composer died on his ninetieth birthday on December 12th, 1788. He was granted a full civic funeral with music played by the Scots Greys and the East Suffolk Militia and was buried in front of the organ in the church of St. Mary le Tower on December 18th. An obituary in the Gentleman's Magazineof December 1788 stated, "The mildness, simplicity and integrity of his manners rendered him universally beloved and respected" and, "in his profession he was eminently distinguished, both as composer and performer."